This is a photo of my father taken in May, 1941 when he was 18 and before he went to war. He worked as the orderman for the local grocery store in Macksville, on the mid-north coast of NSW, which is where he was born (and so was I). He used to take orders, then deliver groceries all over town on this bike, luckily it is a very small town and was even smaller in 1941. This photo is taken on the family farm on the edge of town where he grew up. If you drive through Macksville now, the fig tree in the background is still standing, it is on the north side of the town beside the Pacific Highway (though the highway was not there at the time this pic was taken, it was re-routed in the 60s) and you can often see a police car under it with a radar camera. Anyways, looking at the vintage cycling aspects of the photo, note the trouser clip, the upturned drop handlebars, the mudguards and the fact that he was wearing a collar and tie, even to do such a menial job (and it also gets very hot up there in Summer). I do love the old style wire basket on the front of the bike. I can’t make out the writing on the downtube which is presumably the brand name of the bike. Maybe it says Maxwell? And what a great way to advertise a business, with the sign in the diamond frame of the bike. Here is another photo taken the same day with his baby cousin in the basket. 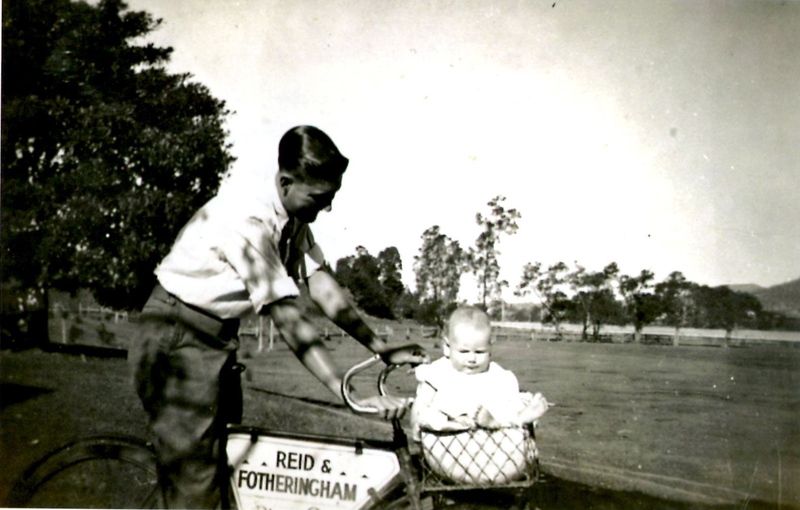 You can see the name of the business he worked for, Reid & Fotheringham, and in the background is the river that runs through Macksville: He is still alive and very much kicking at 88. 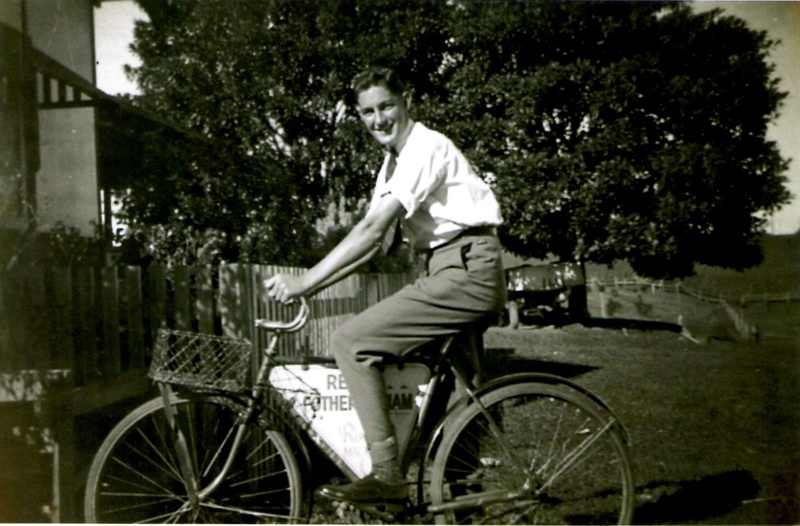 This entry was posted in Vintage bikes and tagged about me, Macksville, old bike, quirky bike, vintage. Bookmark the permalink. A really nice post, Vicki. Thanks Peter. I added a little more to it. If you see bikes with MaXvill as their supposed brandname you will know where they were done up and when now! … thanks for the proper terminology Shawn! 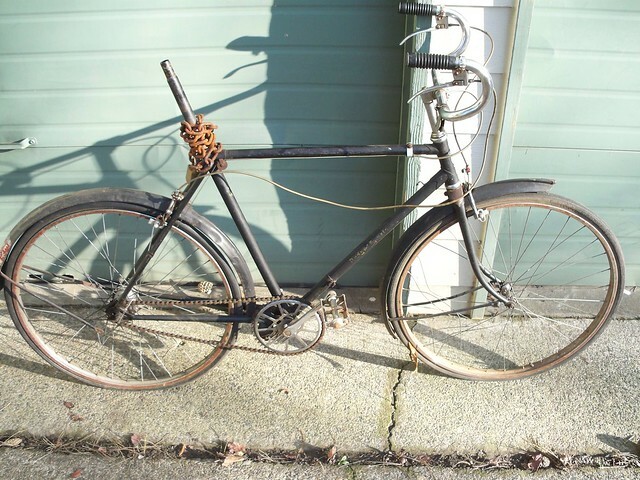 And that Rudge Sports looks like a great restoration project too, I look forward to reading about it.